So obviously Sweet Potato Bites is a food blog, and you are probably wondering why this post is titled “On Running a Half Marathon.” In addition to making and eating delicious food, I also like to run. I just completed my first half marathon with the Englishman, and I wanted to share my thoughts here. But not to worry, I have an awesome “power cookie” post coming up later this week! I remember when I ran my first 5k about four years ago. One of my friends had talked me in to running one with her and I remember crossing the finish line in just under 30 minutes with a sense of pride and accomplishment. Prior to that 5k, I had never run in a race ever, and only ran on the treadmill off and on. After that 5k, I ran another, and then another, and eventually did a 10k but never progressed further than that. A half marathon was always on my “bucket list,” but I never thought that much of it, because quite honestly the idea of running 13.1 miles was kind of terrifying. The Englishman started running with me and we began doing short 3-4 mile jaunts around the neighborhood, and even ran in a few 5ks. Then we moved to a new neighborhood surrounded by wonderful running paths and the idea of a half marathon began to slowly creep back into my head. Could I run 13 miles? 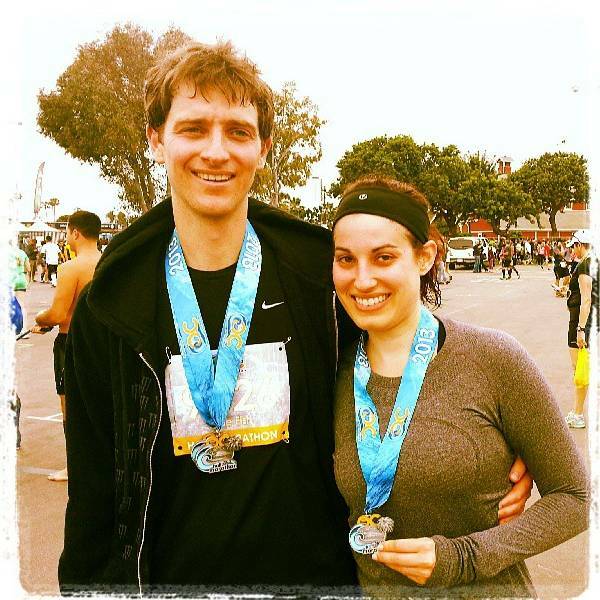 I decided to make it my resolution for 2013 and before I knew it the Englishman and I had signed up for the OC Half Marathon on May 5th. I decided to put together a training plan that had us running no more than 3x a week since there are other workouts we enjoy like Barry’s Bootcamp. The plan ran from January to May which gave us lots of flexibility should any conflicts arise (illness, work, injury, etc.). Of course starting a training plan in January meant lots of runs at 6am in the dark, in the cold, in the rain and in the fog. I’ll be honest, March and April were my favorite months of training. There were good runs and not so good runs. Runs where my legs felt light and our place was flying, and runs where my legs felt like lead and were so sore that I wanted to cry (and I did cry, which I’m sure other runners on the trail appreciated). And as we ticked off each long run, my confidence began to grow. Which brings me to race day, the day that we had been anticipating for 4 months. I had a few rough time goals in my head but had no idea how I would do since I had a few rough runs in the weeks prior, and my garmin had conveniently stopped working, which meant I was going into this race blind which in hindsight was actually better. We lined up in the corral and got ready to start. The horn went off and we started making our way around Fashion Island and down towards PCH. The first few miles seemed to tick by, especially since we started on a nice downhill. We made our way into the fancy neighborhoods in Corona del Mar and before I knew it we had hit the 10k mark. I knew we had some pretty intense hills coming up (since we ran them on our long runs), so we both tried to pace ourselves and started taking our Honey Stinger Chews (love these btw!). We started to make our way into Costa Mesa and hit our first big hill and ran up that with ease. The next couple of miles were a bunch of rolling hills with the exception of one unwelcome hill around mile 9.5. After that it was a bit more downhill and one more big hill push before we started to make the turn to head into the finish line. I’m not going to lie, those last few miles were hard. My legs were burning and I just wanted to be done. But then I saw a dude running in a target sundress and spandex shorts and encouraging everyone to give it one final push so I gave it my all and sprinted towards the finish line. I was shocked to learn my finish time was 2:05:21, which was one of the “A” goals I had given myself going into this race. Now I’m not a super fast runner by any means, but I am incredibly proud of the Englishman and myself and how we ran this race. We trained smart, tapered smart, and ran smart. And I ran a half marathon! The point of all these ramblings is that anyone can run a half marathon. Really. If you put in the time, and put in the training, you can and you will complete the race. I fully believe this after running the race that I did. So will I run another one? Yep, but probably not for awhile. The Englishman and I started to get burned out on running towards the end of training and are ready to try new workouts such as crossfit and focus on short distances for awhile. But I definitely hope to achieve a sub-2 hour half marathon one of these days. And those are my thoughts on running a half marathon. Next post will be all about food, I promise. 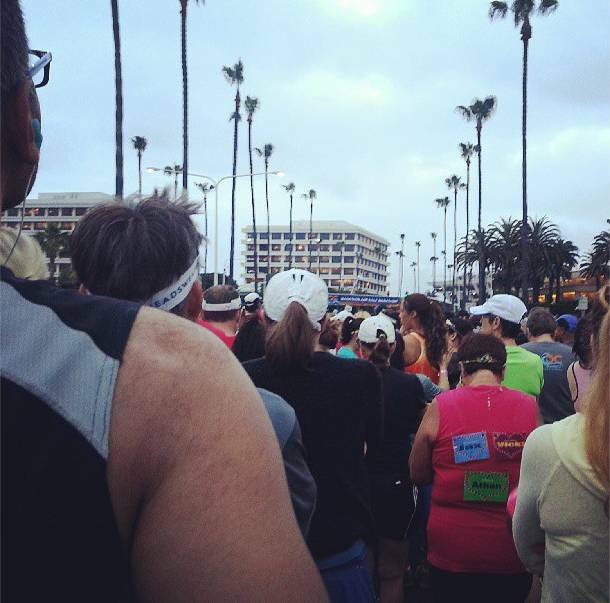 This entry was posted in Best Of, Work It Out and tagged half marathon training, running, running a half marathon on May 5, 2013 by allie@sweetpotatobites. Congratulations! A half marathon is a huge accomplishment. One day, I’d love to do one!